IF NOLAND'S NEW "CIRCLE" paintings recall the earlier "Circles", the recollection is of the motif alone: they take structural color a step further. Because of his return to earlier motifs -- chevrons and parallel bands as well as circles -- Noland's work since the '70s has been too often misconstrued. Too many people see only the reused motifs and miss the fact that the artist's approach to them has changed substantially. Noland observed once that "you can't have color without texture." The corollary to that observation is that texture alters color. The "New Circles" were generally small - generally in the scale of traditional easel pictures, but their size is deceptive. Their intimacy and invention recalls Paul Klee (one of the artist's early influences) but their expression lies entirely in the key of Noland. They consist of concentric circles prefabricated in acrylic reliefs, which have been collaged to canvas and painted. They engage in a dialogue between color and texture that has antecedents in the "80s Chevrons" and the "Papers", but with an immediacy gained from the intervening "Doors" and "Flares." Color complexity has been taken to a new extreme. 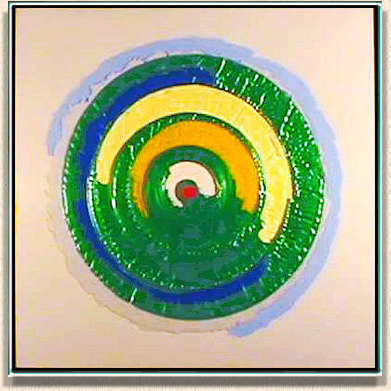 Canvas, plastic collage, paint -- in these new circles each has its own timbre and pitch. The paint textures vary enormously: matte and shiny, translucent and opaque, shimmering and dissolving. To this end Noland enlisted a rich panoply of modern pigments: iridescence, holography, pearlessence, colors matte and shiny. The heady mix provided an unprecedented range of color feeling. The paintings could be spare and reduced or complex and florid, could reverberate evanescently or sit lean and still and silent. But they spoke and sang as small Nolands at a new high level.